ASHLAND Located off Interstate 5 in Southern Oregon within the beautiful Rogue Valley in Jackson County, below the Siskiyou Mountains. Historic Ashland is beautifully located approximately 15 miles north of the California border on Interstate 5, and is close to Majestic Crater Lake National Park, the Wild and Scenic Rogue River, and the unspoiled Southern Oregon Coast. The natural centerpiece of Ashland is spectacular Lithia Park. A walk through the 100-acre park is a must in any season. Two special areas, the Japanese Garden and the Sycamore Grove, offer inspiration through their quiet beauty. Everywhere you look, there are reminders of the past, from pioneer vintage buildings to Victorian houses. Ashland is the ideal city for a stroll with suprises and interest around every corner. Famous as the home of the Oregon Shakespeare Festival, Ashland has become a center for contemporary Theatre. Apart from the varied arts on show Ashland is a beautiful visitors city with splendid shopping and a uniquely beautiful park. Mt. Ashland Ski Area is the popular local ski area. There are 23 ski runs, 80 miles of cross country trails, and it's only 15 miles from downtown Ashland. Today, Mt. 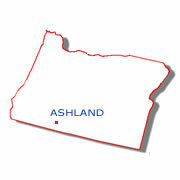 Ashland is one of the most successful community owned ski areas in the country. Ashland, built on the banks of Bear Creek, also has the Bear Creek Bike and Nature Trail. A favorite of bikers, the trail runs along Bear Creek, then down the valley to Medford. On the 28 mile Lithia Loop Mountain Bike Route and the 31 mile Siskiyou Crest Mountain Bike Route bikers will enjoy spectacular views of the Siskiyou Mountains and Mt. Shasta. There is also river rafting and jet boat rides on the Rogue and Klamath Rivers, and many pristine mountain lakes for anglers. Golfers can tee off at one of the five golf courses in the Ashland/Medford area. A special attraction in Ashland is the Pacific Northwest Museum of Natural History, located adjacent to the U.S, Fish and Wildlife National Forensic Laboratory.